We live in time when technology changes fast. Maybe too fast. Keys and buttons on our phones are. We have got smart phones. As always, newest technology does not come without challenges. Mayor struggle with smart phones can be the touch screen. Clumsy fingers or large fingers, acrylic nails, and even poor eyesight all contribute to words with jumbled letters that leave the recipient playing decoder. Most people have attempted to use the tip of a pen or pencil. It doesn’t work. Sensors of the smart phone screens know better. Getting that perfect precision to accurately hit all the correct letters is near impossible, unless you use a stylus pen! 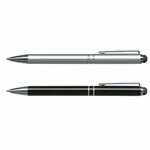 Traditional stylus pens tend to be small, thin and are easily lost. What is the point of having a stylus pen if you never have it on you when you need it? 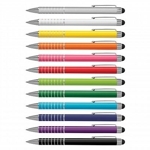 This is why we have a range of pens with dual functionality: a stylus and a pen. 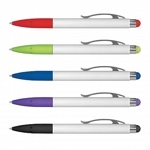 This truly is a writing instrument that serves the most functional purposes, and therefore makes an excellent promotional product. 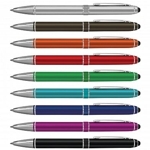 When giving your clients or employees a stylus pen, you are not just giving them a useful product; you are relieving them of the headaches that come with smart phone typing. Modern in design and branded with your logo, message, or contact information, the recipients will know who to thank!